I attended the fantastic demonstration protesting at the proposed closure of BBC 6 Music at Broadcasting House on Saturday organised by the Save 6 Music Facebook group. 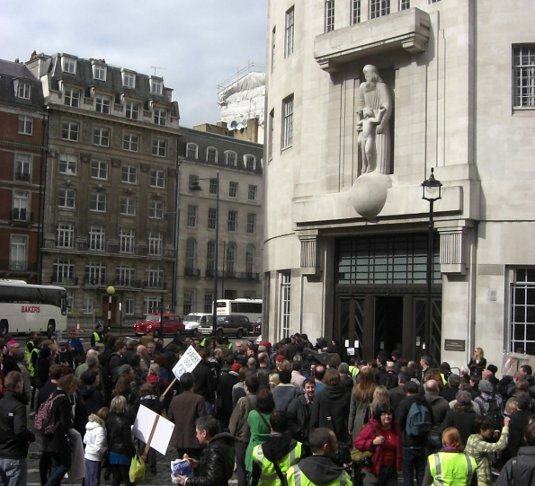 Demonstrators from all parts of the country were joined by many of the radio station’s presenters, including Lauren Laverne, Tom Robinson, Liz Kershaw, Gideon Coe, Andrew Collins and Adam Buxton. During one of the speeches, Tom Robinson made a point that hadn’t occurred to me about the proposals. He said the radio plans covering 6 Music and the Asian Network are part of a larger project that is fundamentally about marketing. He said the management view was that the current branding is too confusing for listeners with too many station names. Therefore the plan is to have Radios 1 to 5, with related stations named 1Xtra, 2Xtra, etc. No surprise given the marketing background of Tim Davie, BBC Director of Audio and Music. Along with the speeches, there was also musical entertainment from The Coal Porters, Mirrorkicks, Black Soul Strangers, The Brute Chorus and Allo Darlin’. Support was also given to the campaigns to oppose the closure of the Asian Network and cuts to the BBC website during the event.